Well, Valentine’s Day is just a few days away. Where do you come down on our national hearts and flowers day? Love it? Hate it? Sort of tolerate it? 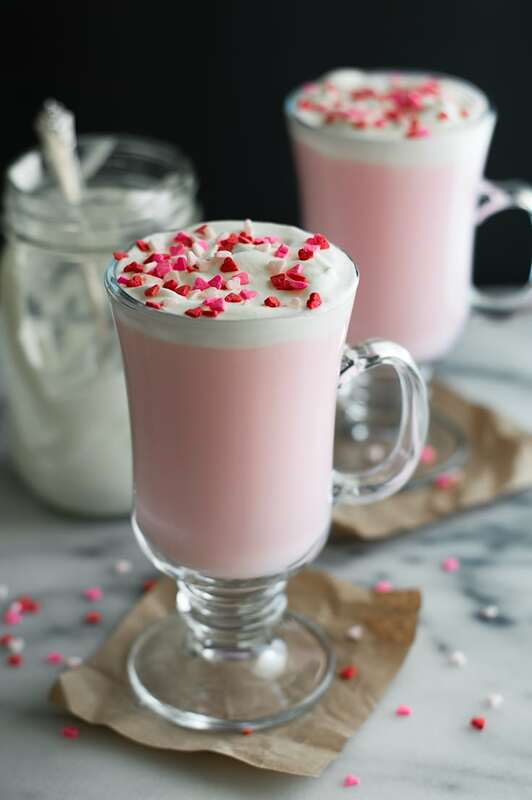 How ever you feel about the day, I have a super quick and easy Valentine’s Day recipe for you that’s too cute to resist: Pink Hot Chocolate with Mason Jar Whipped cream. 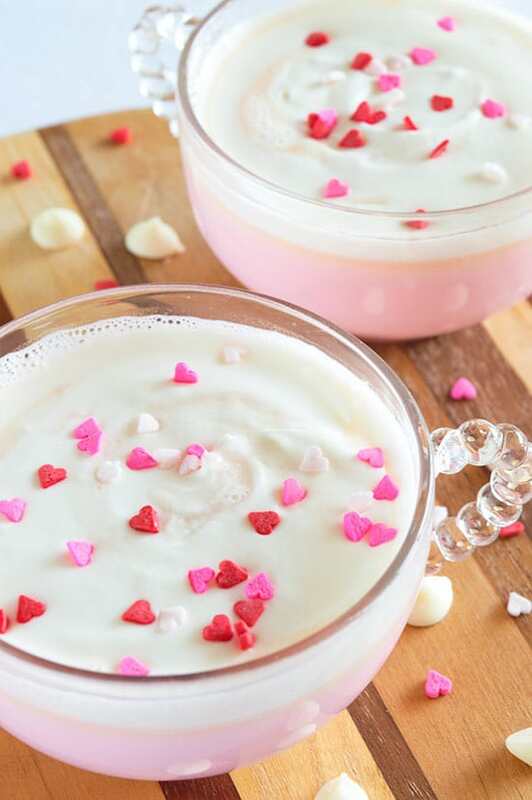 How delighted would partners, kids, roommates, Airbnb guests, whomever you are sharing your Valentine’s Day with, be to come into the kitchen and find a cup of this stuff waiting for them? 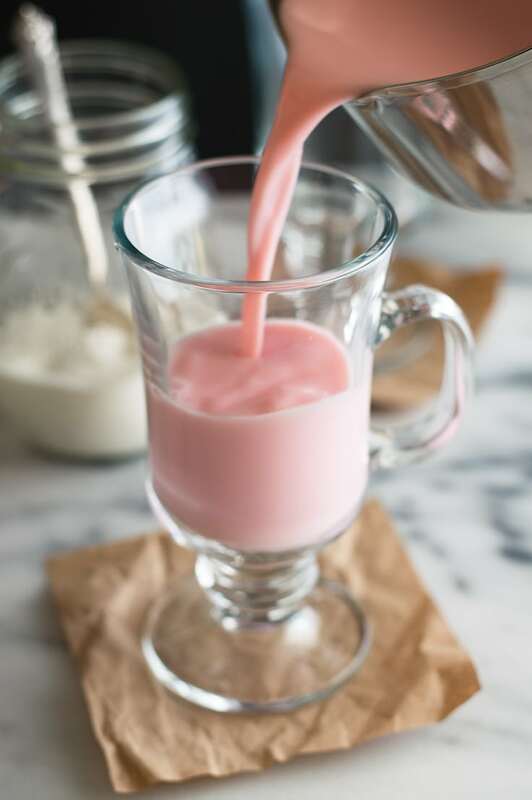 Making the Pink Hot Chocolate is so fast and easy and the whipped cream uses good old fashioned elbow grease, no mixer necessary. If you have a mason jar, a couple minutes, and a dream, you can make this. Two notes on the recipe: make sure to use white chocolate you like the taste of by itself. It should go without saying, but this is what your hot chocolate will taste like. I used low-quality chips that I like fine in cookies but would never eat by the handful in one of my first test cups, and the resulting hot chocolate was so gross I nearly scrapped the entire recipe. For the next cup, I used higher quality chocolate and it was amazing. Good chocolate makes all the difference! Put your mason jar in the freezer for 15 minutes, so it is very cold. Pour in cream, sugar, and vanilla. Screw on lid and wrap the jar in a towel if it is too cold to hold. Shake vigorously until you no longer hear liquid sloshing inside, about 5-7 minutes. Check the consistency of your whipped cream before setting in the refrigerator while you make your hot chocolate. In a small saucepan, heat milk. Add chocolate and stir until completely dissolved and milk reaches desired temperature. Do not allow to boil. Remove from heat and stir in food coloring. Pour into cups, spoon on whipped cream, and top with sprinkles. “If you have a mason jar, a couple minutes, and a dream, you can make this.” hahaha I like you. This really is the cutest hot chocolate ever. This sounds so indulgent! We’re having a bit of a cold snap in these parts (South Florida) and this hot chocolate sounds like the perfect remedy! Definitely the cutest hot chocolate I’ve ever seen! My kids are going to love this! This is so cute!!! Love how it’s pink! 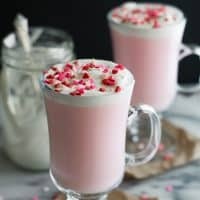 I love cute pink drinks! But Pink Hot Chocolate? Love it! Amazing! 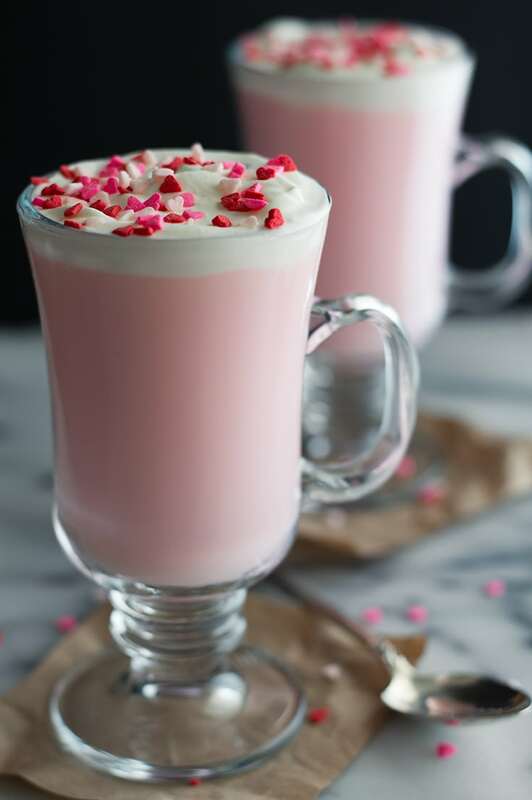 Pink hot chocolate? Now that is unique. It looks great for Valentine’s Day.